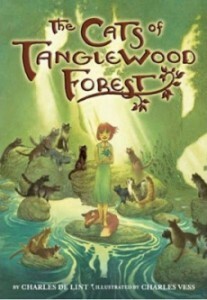 Well-known fantasy author Charles De Lint has teamed up with well-known illustrator Charles Vess to bring us The Cats of Tanglewood Forest, a new hardcover full-color graphic novel coming this March from Little Brown Books For Young Readers. “Lillian Kindred spends her days exploring the Tanglewood Forest, a magical, rolling wilderness that she imagines to be full of fairies. The trouble is, Lillian has never seen a wisp of magic in her hills–until the day the cats of the forest save her life by transforming her into a kitten. Now Lillian must set out on a perilous adventure that will lead her through untamed lands of fabled creatures–from Old Mother Possum to the fearsome Bear People–to find a way to make things right.” From the review at Amazon, of course. And with that, we’ll say TTFN (ta ta for now!) until after Further Confusion in San Jose, California. Take care! Fred later penned a review of this.